BAKE in preheated 425° F oven for 15 minutes. Reduce temperature to 350° F; bake for 40 to 50 minutes or until knife inserted near center comes out clean. Cool on wire rack for 2 hours. Serve immediately or refrigerate. Top with whipped cream (if desired) before serving. 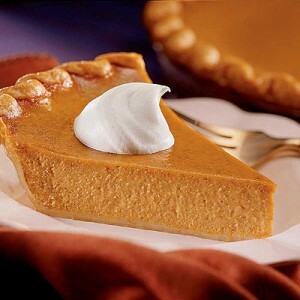 Don’t feel too guilty…each piece of pie (1/8) serving is about 200 calories…the crust and the sweetner is much healthier…and it tastes great!